Time really flies! Before we know it, its already coming to the end of the year again. Before ushering the coming new year, the Chinese always celebrates the Dongzhi festival (冬至) which is a very important event in the Chinese calendar. 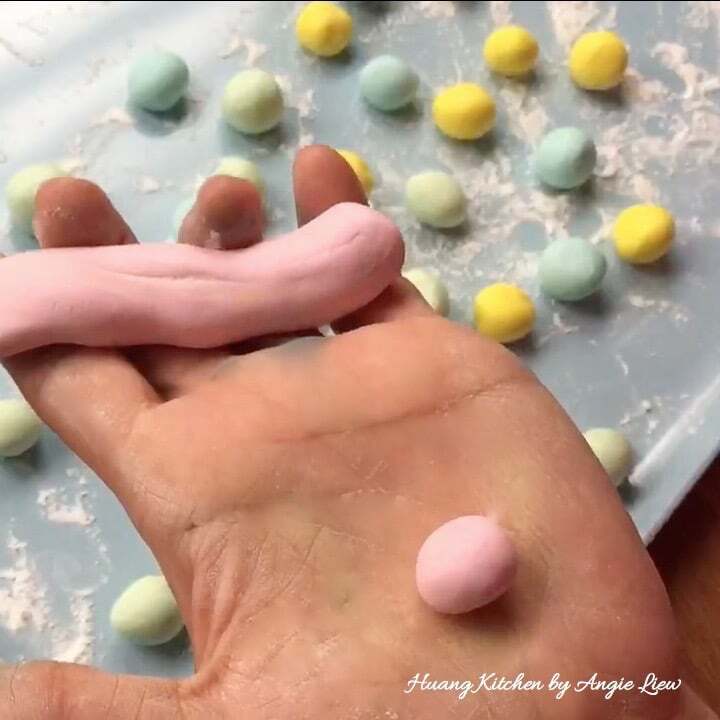 It is a time when family members hold a reunion and gather together to make and eat glutinous rice balls or Tang Yuan (汤圆) which literally means “round dumplings in sweet soup” to mark the winter solstice. These round and chewy colourful dumpling balls are very significant for the occasion as they symbolise family togetherness. unity and happiness. These fun and colourful glutinous sweet balls are mochi-like chewy, doughy and sticky. They are made from glutinous rice flour that everyone enjoys as dessert. These little rice balls are also one of the easiest Chinese dessert to make. All you need is glutinous rice flour and water to make the rice balls. They are then cooked and enjoyed in a classic ginger and screw pine leaves infused syrup with a tinge of sweet fragrance from the sweet osmanthus. 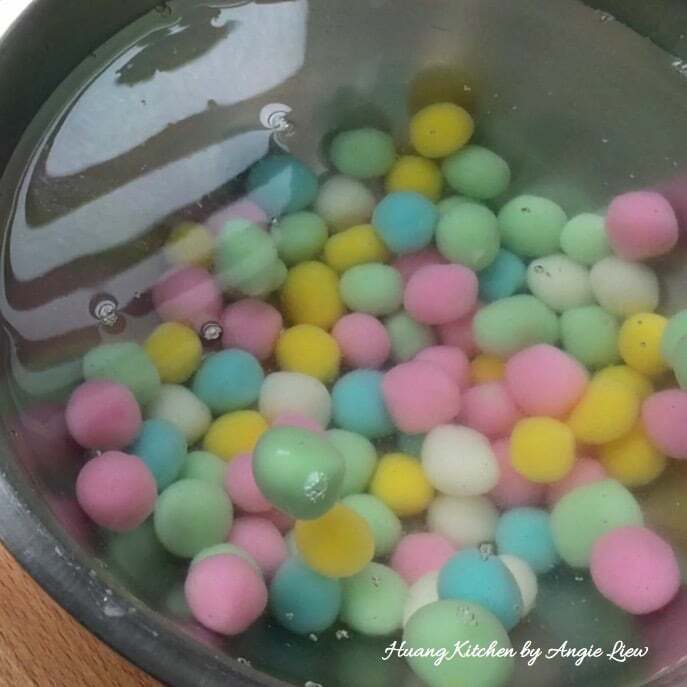 Last, but not least, homemade glutinous rice balls can be really fun and meaningful when your family gather to help shape the balls together. Certainly it’s a traditional Chinese dessert which is well loved by all generations. 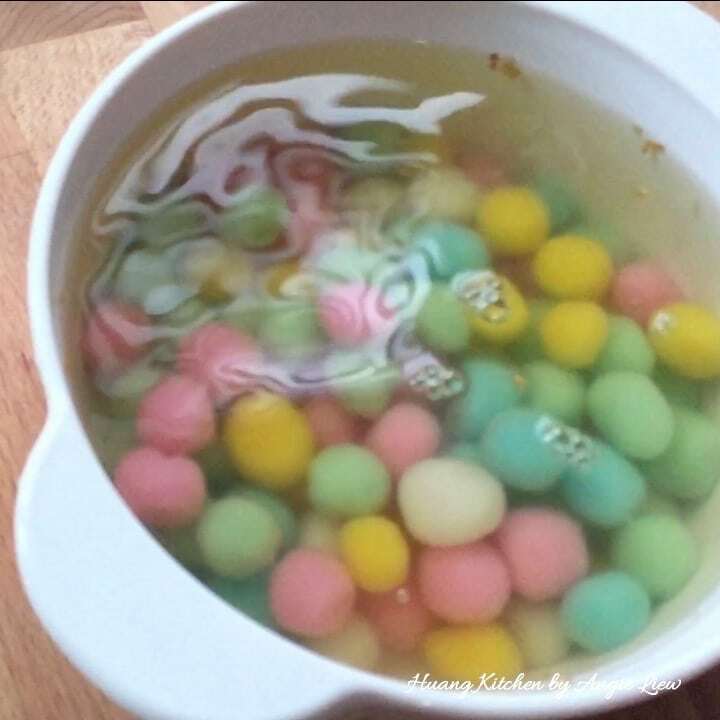 Also known as Tang Yuan, Glutinous Rice Balls are eaten during the Dongzi festival to mark the Winter Solstice. These little rice balls come in bright colours and served in a classic sweet soup infused with ginger, sweet osmanthus and screwpine leaves. 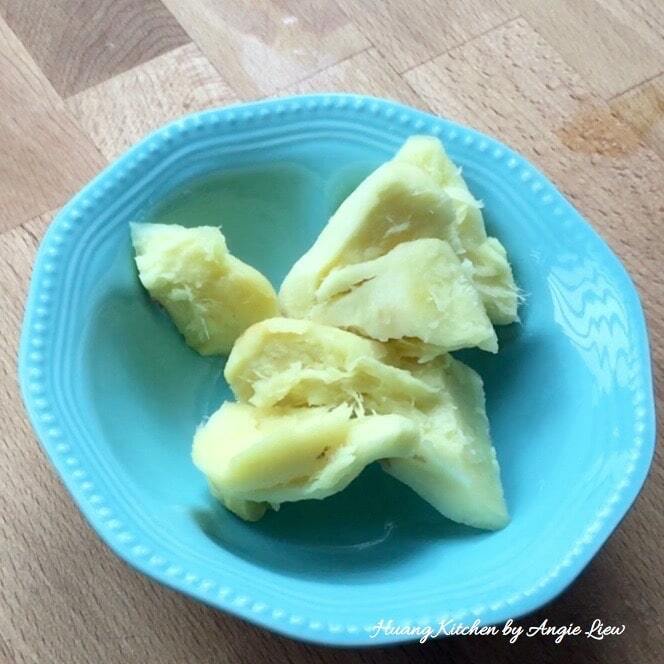 A truly simple and enjoyable chinese dessert! First peel the skin off the old ginger. 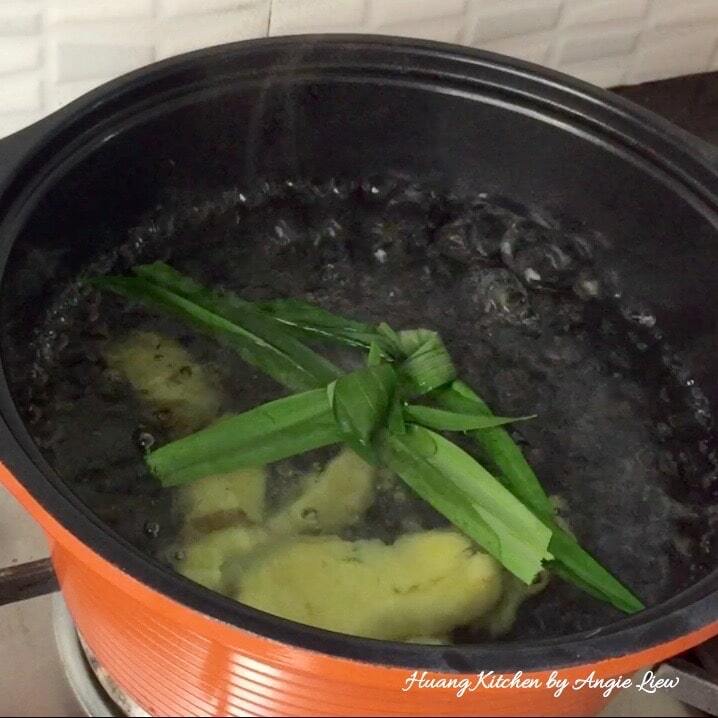 Cut the ginger into thick pieces and lightly bruised them to release their aromatic flavour. Then, rinse screw pine leaves and tie into a knot. And we're ready to boil the syrup. To cook the syrup, first, bring a pot of water to a boil. Add the crushed ginger and screw pine leaves into the water. Cover and continue to boil for 10 to 15 minutes. Then add sugar and sweet osmanthus and boil for another 5 minutes. 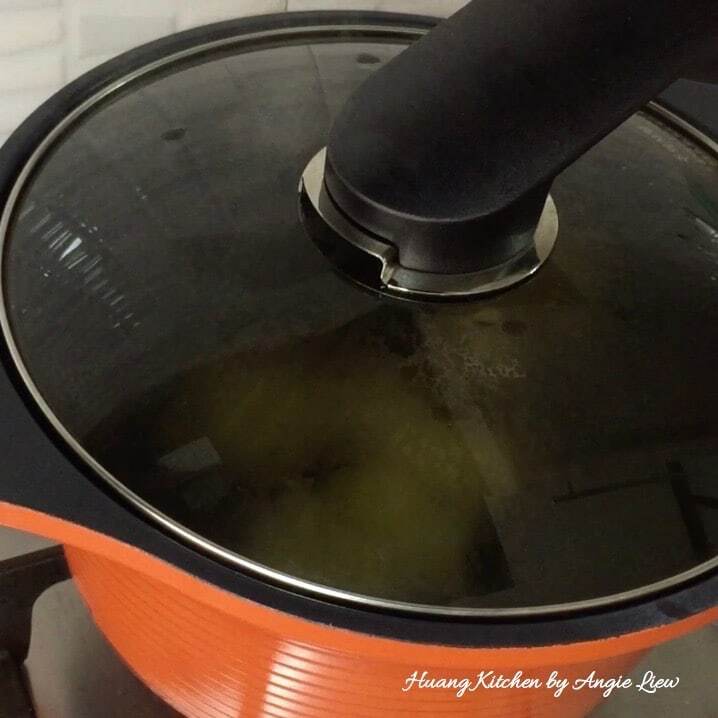 Cover and lower heat to simmer and continue to cook for another 5 minutes, until all the sugar has dissolved and the syrup is fully infused with ginger and sweet osmanthus aroma. Then remove the crushed ginger and screw pine leaves from the ginger syrup. Set aside the syrup to cool while we prepare the glutinous rice balls. 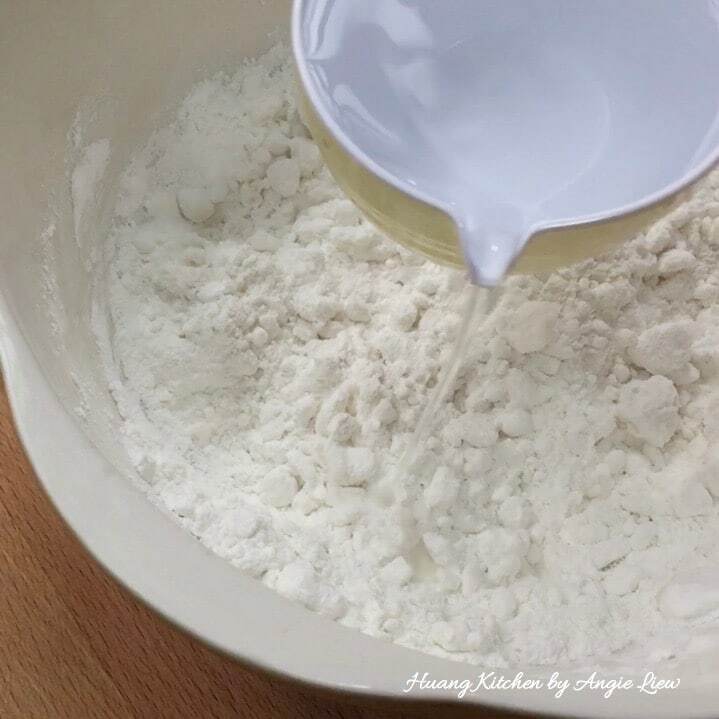 In a big bowl, add hot boiling water into glutinous rice flour to half cook the flour. The hot water will make the rice balls nice and chewy. Using a spoon or spatula, stir to mix well. Then, slowly add some cold water into the dough. Water should be added a little at a time, depending on the humidity of the flour. Knead the flour as you add the water to check on the consistency of the dough. 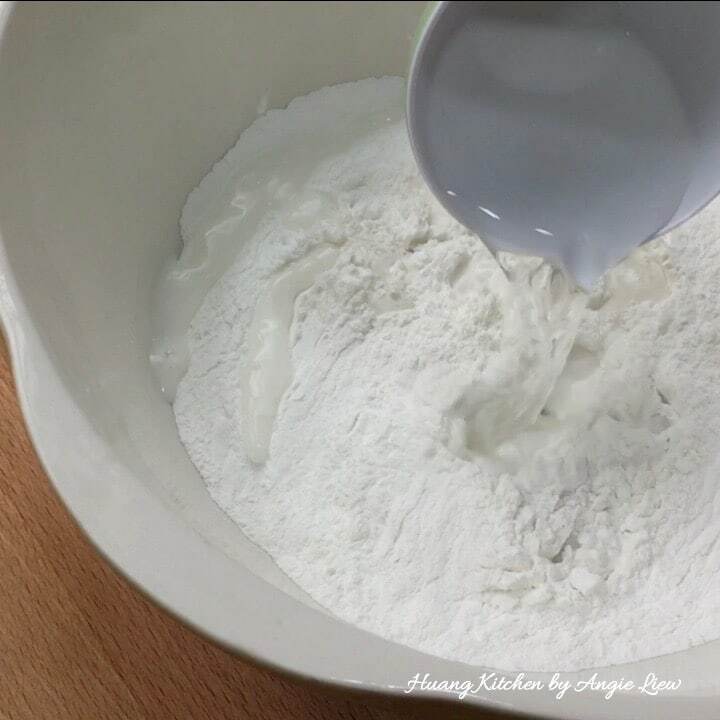 Mix and knead till a smooth dough is formed. 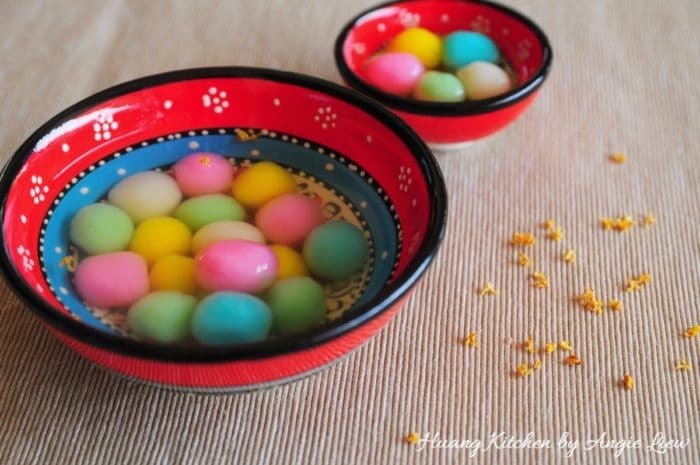 Divide the dough into smaller portions to make colourful glutinous rice balls. Using disposable stick or chopstick, first add red food colouring into one of the dough. Then, wearing plastic gloves, knead the dough until the colour is well distributed. Continue to do the same for the other dough portions using different colours leaving one part of dough without colour. Form each dough into long strips and using the palms of your hands, roll them into balls. It can be in different sizes. 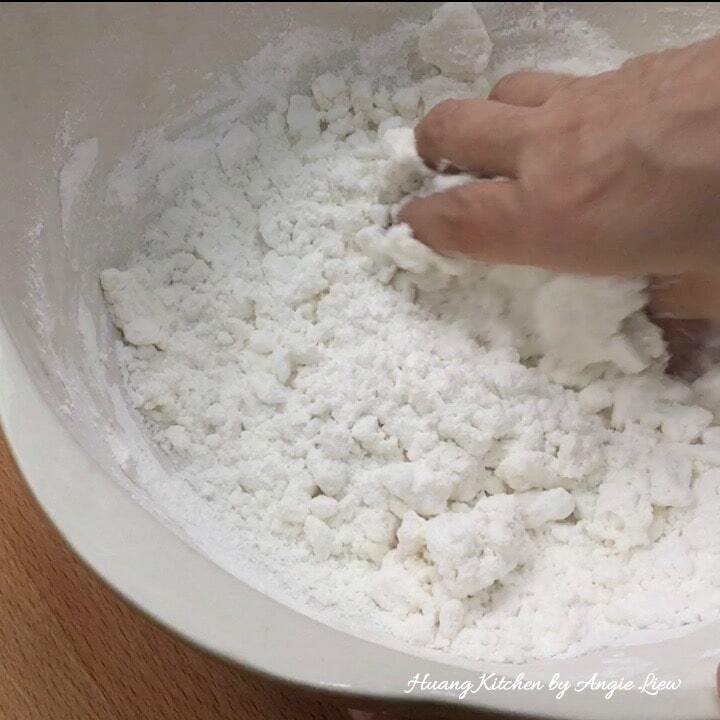 Place the glutinous rice balls onto a lightly floured plate to prevent sticking. Then, cover to prevent drying. And we can prepare to cook the balls! 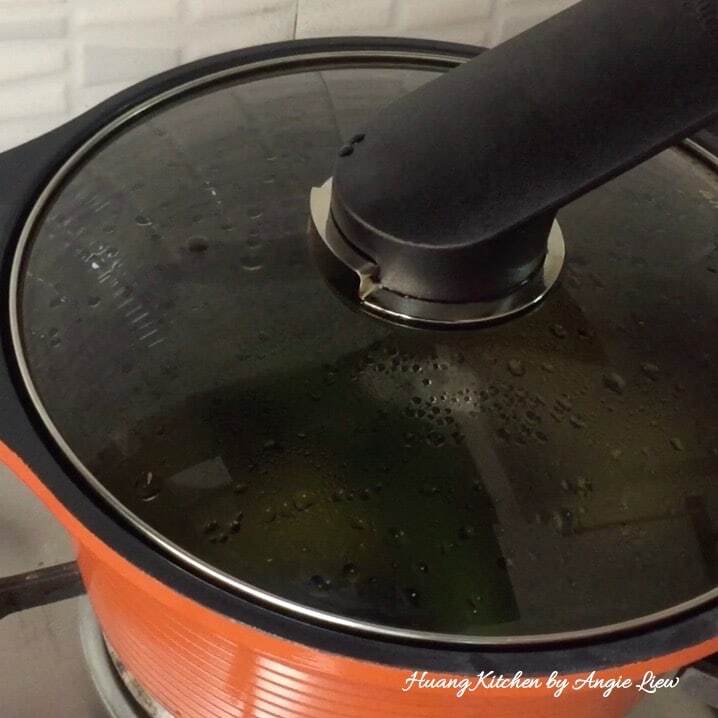 To cook the glutinous rice balls, first bring a pot of water to a boil. Make sure there is enough water to submerge the rice balls completely. Then add in the glutinous rice balls and cook for about 3 minutes. Stir occasionally to prevent the rice balls from sticking. 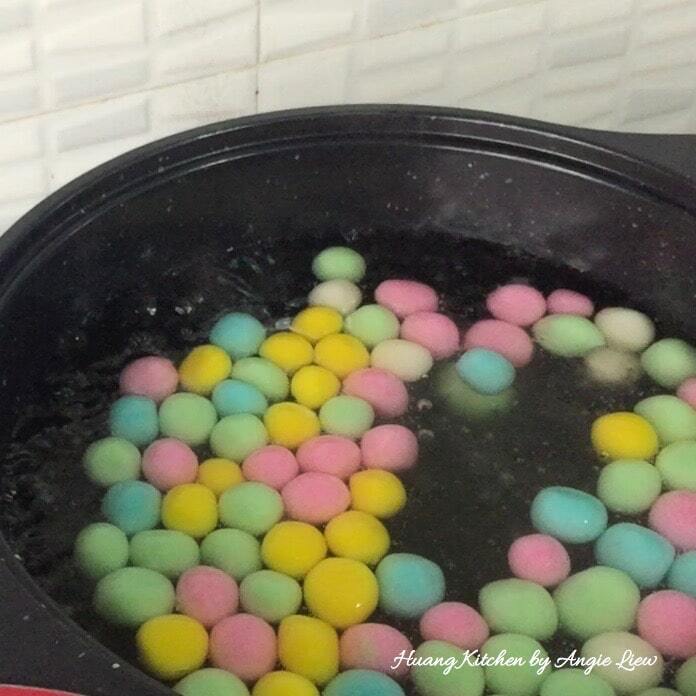 The glutinous rice balls are cooked when they starts to float to the surface. Add 1 cup of cold water into the pot when the rice balls start to float. This is to ensure the glutinous rice balls are cooked thoroughly. Cover and continue to cook till the rice balls float to the surface again. And we're done! 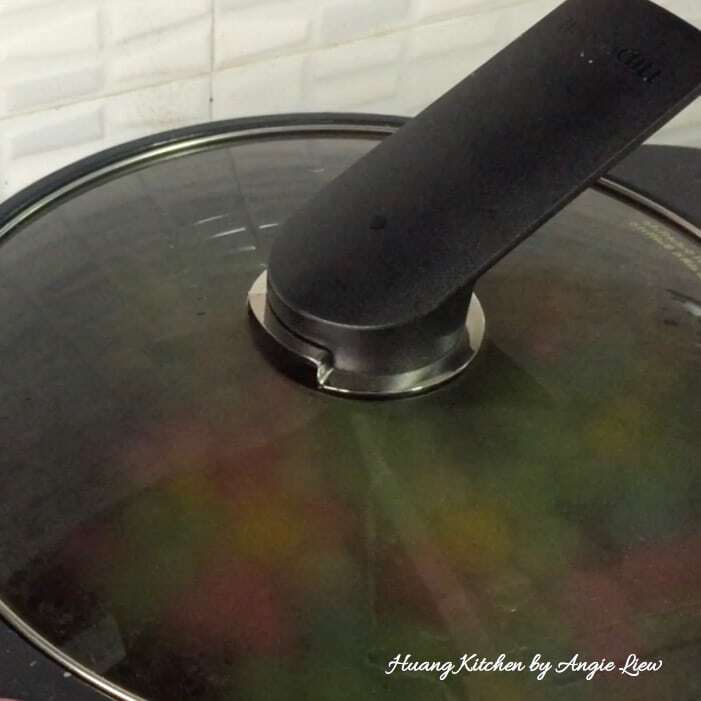 Using a sieve, drain out the cooked glutinous rice balls from the pot. Place them into a large bowl of cold water for about one minute. This will prevent the glutinous rice balls from sticking to one another and make them more chewy. Then drain and transfer the glutinous rice balls into the ginger syrup prepared earlier. And we're done! 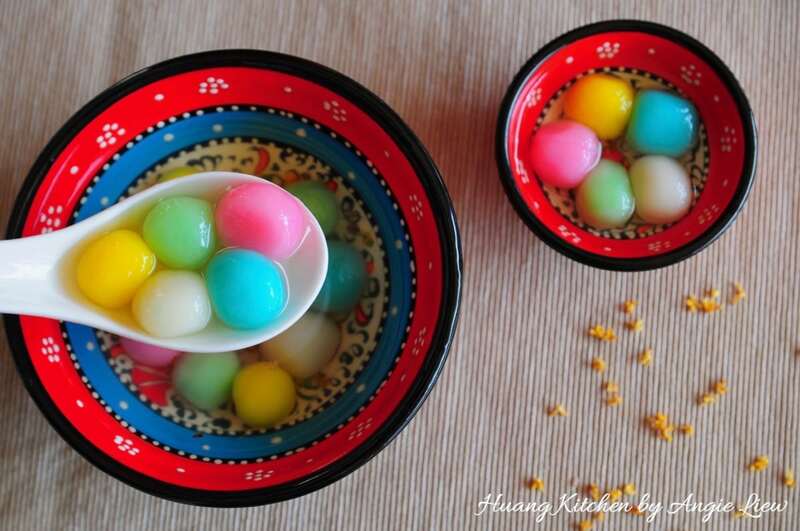 These colourful sweet glutinous rice balls can be served hot or cold. As always, Enjoy! Use old ginger instead of young ginger when boiling the syrup as old ginger gives a more gingery aroma. 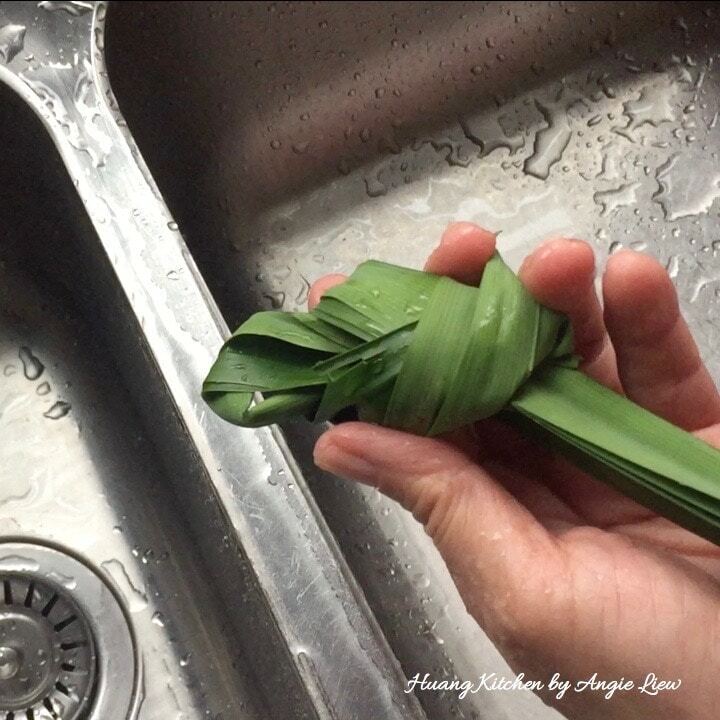 Fresh pandan leaves/scew pine leaves are very fragrant and they bring out lovely flavour in the ginger syrup. The amount of glutinous rice flour and water used is very forgiving. If the dough is too dry, add a bit more water. If its too wet, add a bit more flour. The rice balls will become more chewy if kneaded for a longer time. You can divide the dough depending on the number of different colours you intend to make. Add food colour, a little at a time, to each portion and knead till the colour is well distributed. 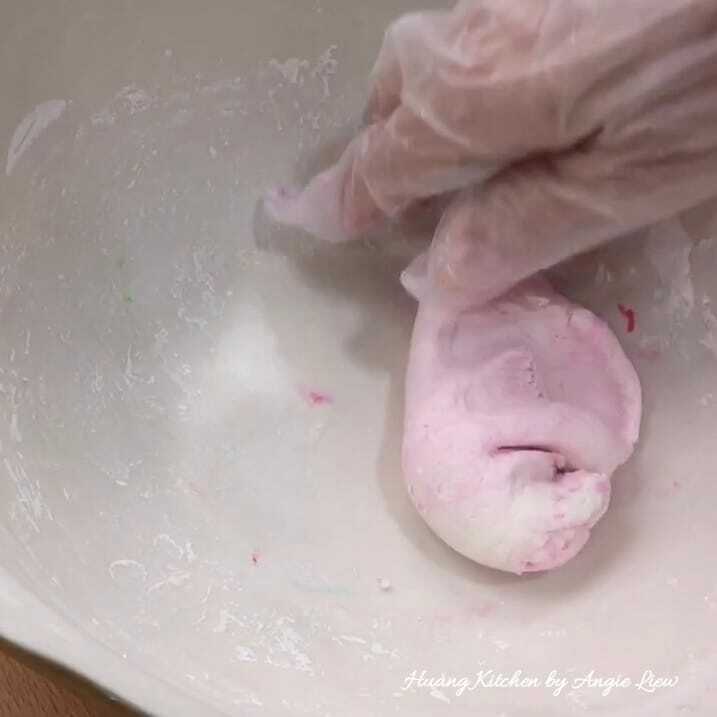 At any one time if the dough feels dry, wet your hands before shaping them into balls.